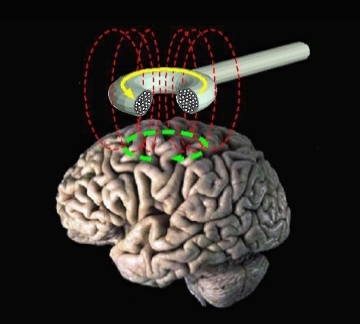 Transcranial magnetic stimulation (TMS) is a neurostimulation and neuromodulation technique that induces electric field in the brain based on Faraday’s principle of electro-magnetic induction and thus interferes with the neural processing. Although its roots stem to the first half of the 19th century, the first successful stimulation of the human cortex was performed in 1985 by Barker (Barker, Jalinous, & Freeston, 1985). Since then, the number of published papers reporting the use of TMS has been increasing rapidly (Rossi, Hallett, Rossini, & Pascual-Leone, 2009). Despite the growing popularity of the method, the mechanisms by which it influences brain activity are not completely understood. This review gives a brief overview of the recent theories and the supporting evidence. However, the main focus of this review is the use of TMS as a research tool in cognitive neuroscience and neuropsychology. I will try to illustrate the broad possibilities of application of TMS in these fields, what questions it could answer, how this technique could be combined with neuroimaging, and discuss the safety considerations related to the use of TMS in non-clinical settings.